This blog post will give you a complete step-by-step tutorial on how to secure a WordPress site with WebARX. If you care about your business you need protection from hackers and for this, you need to have a complete overview of your site, the first line of defence, and an intelligence system that will let you know when there’s a risk and how to eliminate it. 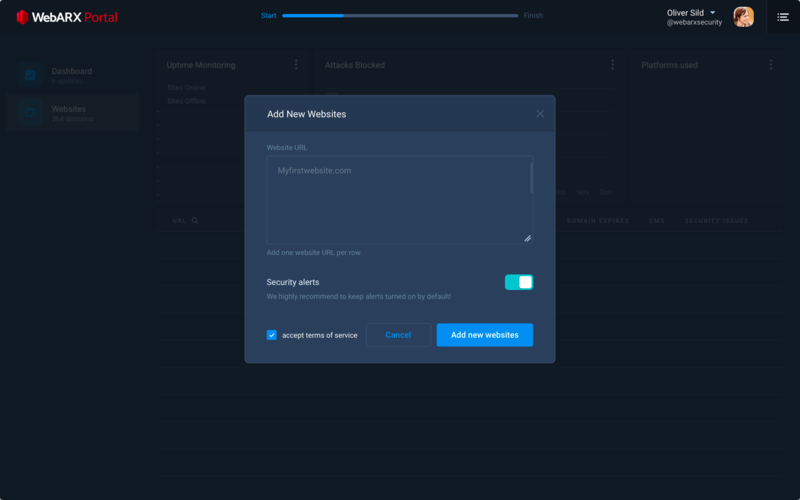 In under three minutes (and with no technical knowledge), you can connect the WebARX plugin to your WordPress site and have your site protected. So, let’s see how to secure a WordPress site. This blog post will give you an overview and step-by-step tutorial about how to secure a WordPress site with WebARX. The first step is to make an account in WebARX Portal. You can start the sign-up process by clicking here. 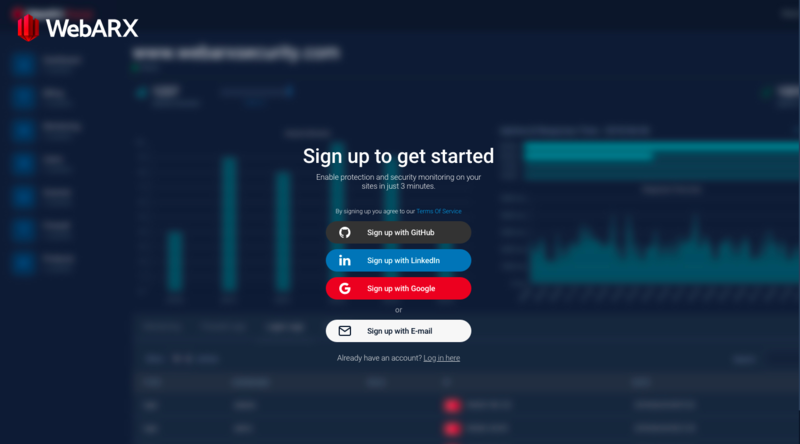 If you have an account in GitHub, LinkedIn or Google, you can easily sign-up via these options but you can also sign-up using your email. If you have already made an account you can log in by clicking the option on the very bottom or you can click here. The very first thing after signing up to WebARX Portal will be adding your first WordPress site. You can add more than one site by adding one website URL per row. Make sure your websites are written correctly. When you have added your site(s) then click “Add new websites“. After you have added your site it will take roughly 10 minutes before data starts showing up on the dashboard and on the individual site view page. In order to see data of a specific site, scroll down on the dashboard and click on your site in the sites overview table. Now to the next step – downloading the plugin to your WordPress site. 1. Install the plugin automatically by entering your WordPress login information. (Keep in mind that we don’t store your login information on our servers, it is directly and securely used to install WebARX on your site.) If you have installed the plugin allow it to configure itself by waiting 5 to 15 minutes before everything is synchronized with the portal. Now click the grey icon, to download your plugin. Make sure you check where do you download the .ZIP file so you could easily find it later when you add it on your WordPress site. The next step is to log in to your WordPress site. At the menu on the left click on Plugins, press Add New and then click on Upload Plugin. Installing the plugin is really simple. Click on “Choose file” and select the .ZIP file you downloaded from the Portal earlier. Then click “Install Now”. 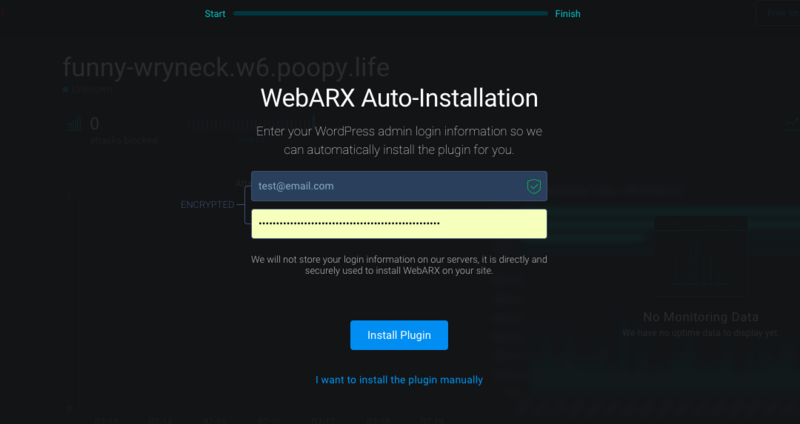 As the final step, you only need to click “Activate Plugin” which will connect your website with WebARX. It will configure everything automatically and enable a dashboard widget so you can see logs and statistics on your WordPress dashboard. Great, now you’re protected with WebARX! If you followed every step – your website is now connected and protected with Web Application Firewall. Our Web Application Firewall is updated in real time and it will be updated with the latest threat signatures automatically. It will block malicious traffic, hacking attempts and even spam. It can sometimes be surprising how many attacks are actually made and how many different IP addresses try to find weaknesses on the website. You can see from the single site view – Firewall logs, Activity logs, and Software. This is where you can see if someone has tried to attack your site or who has logged in. Software tab will show you what software is installed and if any of them are vulnerable or known to be exploited. In September we are also making it possible to upload plugins and software on the website from the portal without the need to log in to the websites. Check out our Product Roadmap. How are hackers earning money with your website?